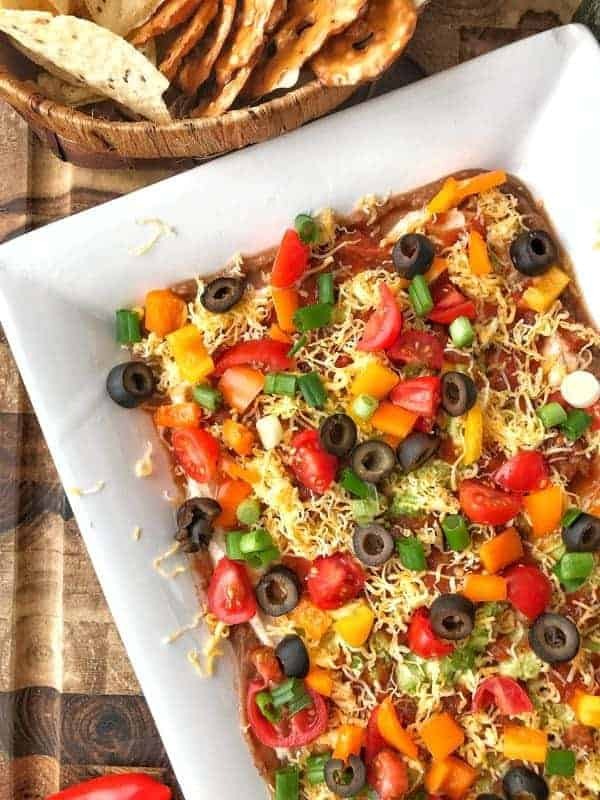 This layered taco dip recipe has fewer calories and fat compared to other versions of this traditional chip dip, but keeps all the flavor! Living in Green Bay, Wisconsin, it’s nearly impossible to not be a football fan. It’s in our blood, people here like to say we bleed green and gold. If you follow football, you will know that 2017 was not our year. Our beloved quarterback was out with an injury and the team went downhill fast. What do we do now that we are out of the running? We root against our midwestern rivals in the playoffs, that’s what we do. 😉 And to do that, we need some delicious snacks. I have been making taco dip for years, but never put pen to paper. This taco dip recipe is packed with veggies. 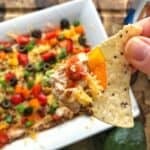 Everyone loves taco dip, so why not take advantage of the opportunity to easily get more veggies into kids and adults alike? The best part? You simply cannot mess this recipe up- it’s super easy and very customizable. 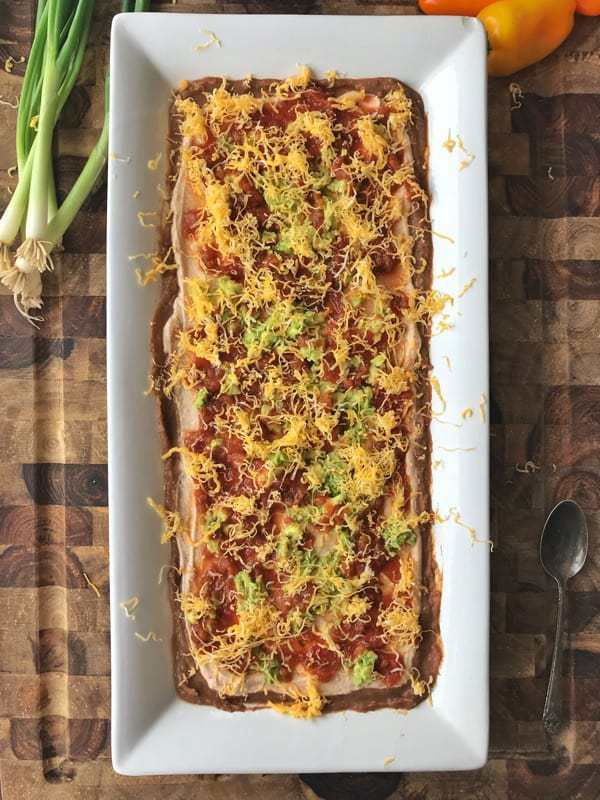 I love serving this taco dip on a platter, but a bowl or casserole dish works too. Spread refried beans on bottom of serving tray or casserole dish. In a medium-sized bowl, mix Greek yogurt with spices. Spread on top of beans. Layer avocado on top of yogurt mixture. Serve with pretzel crisps and tortilla chips. Start with a base of refried beans. 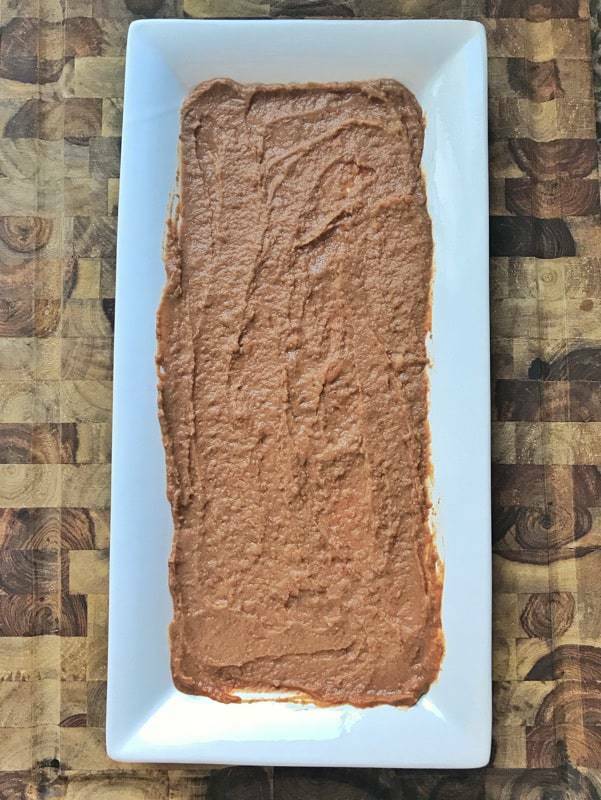 I used frozen beans from my favorite homemade refried bean recipe —> find the recipe here —> otherwise a can of refried beans works great too. Next, you’ll season the plain Greek yogurt. I like to use spices I already have on hand, but if you want to make it easier, simply use a taco seasoning mix. After you layer the yogurt on top of the beans, top that with mashed avocado. You could use guacamole, but to save calories and money, I simply use 1 avocado. Next come the salsa and cheese spread on top of the refried bean dip, Greek yogurt mixture, and avocados. Last, add the veggies on top. 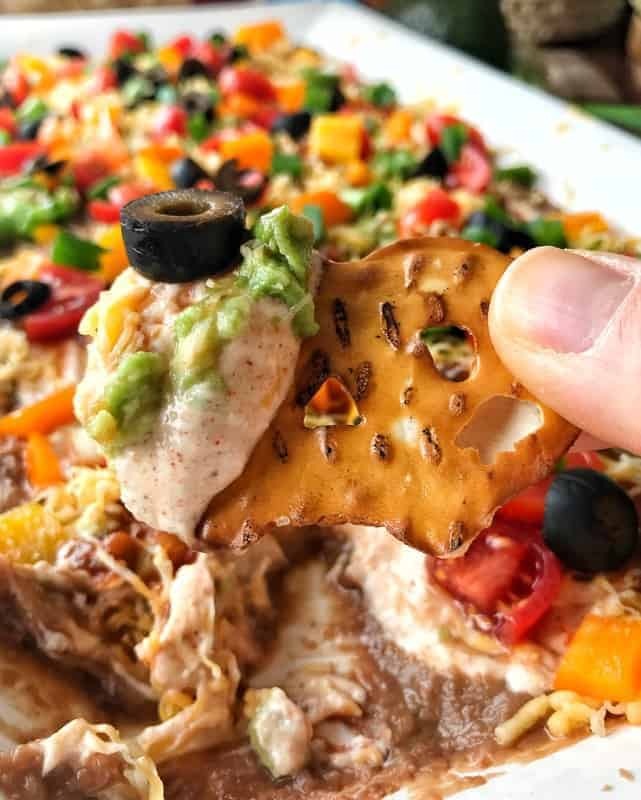 Scoop this layered taco dip with chips or pretzels, or as I like to do – both! A simple game day appetizer that helps control calories and fat, adds veggies and is simple to make. That’s a winner in my book! Looking for more game day recipes? 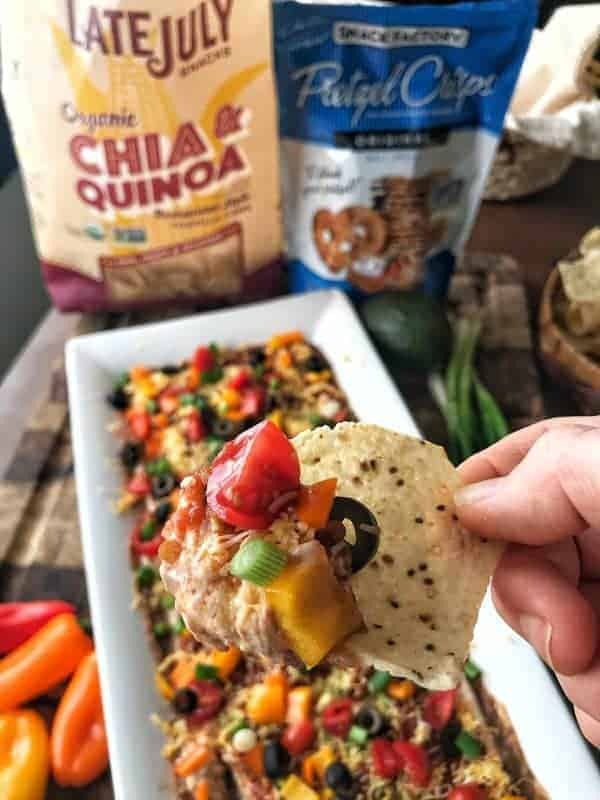 Try my 7 Layer Bean Dip, Chicken Pinwheels, Mediterranean Hummus Dip, or Low Fat Sriracha Hummus. 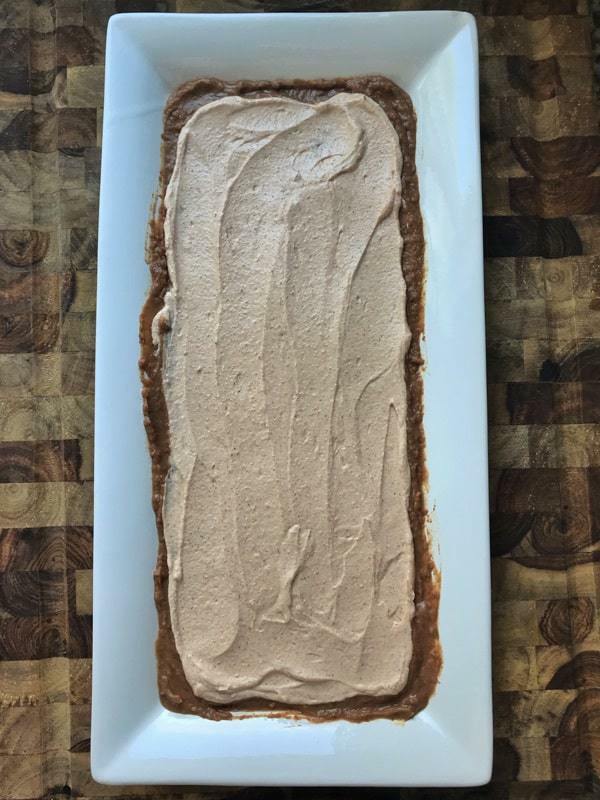 If you enjoyed the recipe make sure to leave a comment and a star rating below! Then follow me on social media and tag #createkidsclub if you make the recipe. I love seeing what you come up with! 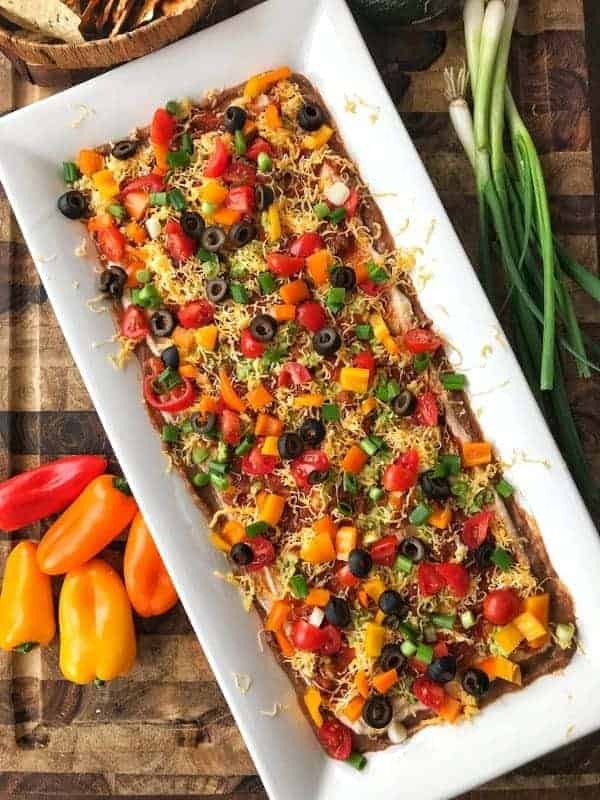 Mexican layer dip has fewer calories and fat compared to other versions of the traditional taco dip, but keeps all the flavor! 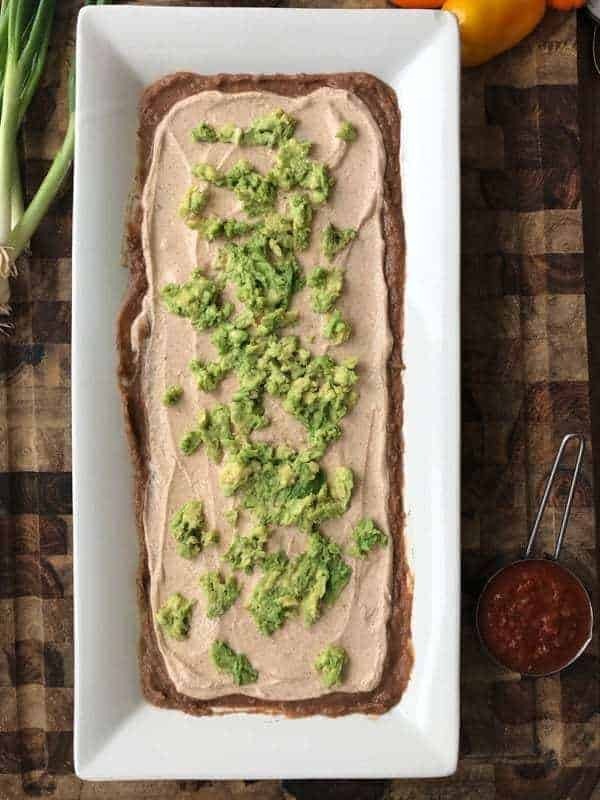 A must try refried bean dip. veggies of choice, such as tomatoes, black olives, peppers, green onions, etc. In place of spices, you may use a package of taco seasoning. Challenge your family to a fun-filled Family Chopped Game and make dinner in the process! Even the littlest of kids can play. Get step by step instructions PLUS score cards when you sign up for our newsletter! This is my go to taco dip recipe. Thanks for the yummy appetizer! Hi, I'm Jodi! I'm a registered dietitian & mom of two from Green Bay, WI. You'll find easy, nutritious recipes, tips on feeding kids, along w/ successes & failures I've learned along the way.